Kirkus adds that Bernecker's points are "well-researched and well-articulated," giving the reader "a thought-provoking look at the modern definition of God." 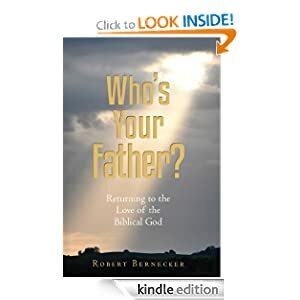 Amazon reviewer carpenterdaughter writes, "Bernecker faces some tough questions and doesn't attempt to defend God. He declares and reveals God. He points readers to the truth, and he uses God's own word to do it." This eye-opening new book challenges readers to reevaluate their perceptions of God, and it thoughtfully exposes many misconceptions that are commonly found in the church of our day. Readers are led into a deeper understanding of the real God of the Bible and shown the path to a new and immensely satisfying relationship with their loving Father. This compelling work is a thought-provoking and inspirational examination of how today's church views God. As the church struggles to truly experience the unchanging love of our heavenly Father and to rest confidently in God's perfect purpose for each of our lives, the cause of this crucial deficiency is usually overlooked. Who's Your Father? explains how our concept of God has grown increasingly flawed, and it reveals how we have been taught to view our sovereign Father as a benevolent gentleman who won't interfere with human free will. By fostering this view, we've unknowingly created a weak, unreliable, and frustrated God who we falsely believe will only occasionally choose to use his divine power to actively work in our lives in a powerful and effective manner. Writing from the down to earth perspective of a well-versed layperson, Bernecker skillfully shows how we rob ourselves of incredible blessings when we miss the vital connection between the unlimited sovereignty and the unbounded love of the true God of the Bible. An illuminating look at the true nature of God and his dealings with mankind, this extraordinarily insightful book will change readers' lives across the globe.